Using an unsecured or open Wi-Fi network doesn’t keep your information safe, but did you know that the default settings that came with your home router aren’t much better? 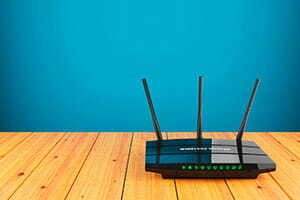 Even if you have a secured, password-protected Wi-Fi network at home, you may be vulnerable to hacking. When every other week brings a new story about a security breach, including access to home security cameras, smart home products, and baby monitors, you know it’s time to take the security of your home wireless network seriously. We’ve got the top five ways to make your home network more secure. The first and most basic step is to change the name and password for your home wireless network from the default settings. Your Wi-Fi provider automatically assigns a name to the network, and anyone who knows where to look can easily find default passwords online. 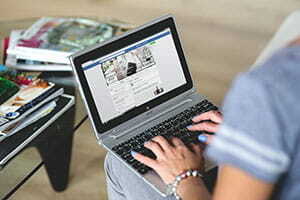 Changing the name and password makes it more difficult for hackers to identify whose Wi-Fi it is and access the network. With that in mind, avoid using any family names or significant numbers (house number, birthdays, anniversaries, etc.) in your passwords to avoid identification. Instead, use a combination of letters, numbers, and other symbols to create a new password that is hard to guess. Just as you did for the wireless network, change the default settings for your router as well. In particular, create your own hard-to-guess password for the administrative login. The “admin” has control over many things, including the router’s firewall, which devices can connect to the network, and which sites are allowed. The admin can see all information that passes through the router, so you definitely don’t want a hacker to gain access to it. Also, make sure your router uses WPA2 encryption. Encryption, or scrambling the data on your network, is the best way to prevent anyone else from listening in. Even if someone is able to hack into your network, they won’t be able to read the information without the encryption key, and the most secure type of encryption is WPA2 (Wi-Fi protected access). If you have devices more than ten years old, they maybe not be compatible with WPA2, and if that’s the case, it’s time to upgrade your devices for both increased security and performance. If you aren’t sure if your router uses WPA2 encryption, you can check by opening up your network settings and looking at the wireless properties. For Windows computers, you can check and change your encryption setting in the security portion. For iOS computers, you can choose which type of encryption to use when you join a wireless network. The most effective thing you can do to protect your home network is to make sure your router firmware is up to date; however, this step also requires the most effort. Firmware essentially tells the hardware of a device—the actual, physical parts and pieces—how to work, and companies occasionally discover security problems that require an update or fix to the firmware. Unlike software updates, which are often automatic, firmware updates require you to check the official company websites for firmware updates, then follow their instructions for installing them. We recommend setting a calendar alert every three months or so to remind yourself to check. An optional but recommended security measure is to sign up for a VPN service. VPN stands for “virtual private network,” and it essentially creates a secure connection by hiding the location of your computer or device. It’s more complicated than that—and there are many different ways a VPN can work and a range of VPN services—but essentially, it obscures your location so that a hacker has to find your network before trying to break into it. Each VPN company will have detailed instructions for getting set up, and often you’ll need to download a program to your computer, but from there the process is very simple. Most VPN services cost less than $15 per month if you decide to add that layer of security to your home network. The good news is that many of these devices already have built-in security measures, high levels of encryption, and required passwords, so keep those features in mind as you look for truly secure products to add to your home. Don’t wait to begin making your home wireless network more secure. Even if you aren’t a computer person and terms like IP address make your head hurt, you can still implement these steps to protect your Wi-Fi. Make sure that all of the devices connecting to your home wireless network are as secure as possible, and you’ll be ready to enjoy using the internet without worrying about who else could have access to your network.